Keep Bears Out Of Your Backyard! He’s cute until he’s in your backyard! Everyone fears the day that they come home and surprise an intruder. I had a big scare a couple of years ago when I came home and found a bear looking right into my home’s windows! I was lucky, and he ran off as soon as he saw me, but you can bet I immediately looked into what I could do to keep bears away from my house! If you can avoid putting out garbage more than an hour or two before collection time that would be ideal, but if you can’t then make sure your garbage is very well sealed. You should also avoid placing garbage or pet food inside a screened porch. This just encourages bears to try getting inside and they are smart enough to open screen doors with lever style handles and strong enough to tear screens easily. Be careful with your grill if you’ve been cooking outside. Clean it well and, if possible, put it away inside your garage. Bears like the smell of hamburgers just as much as you do. Taking these precautions is especially important if you have a dog. Dogs will often try to defend their yards against bears. If you must leave your dog outside unattended then build a strong fence. 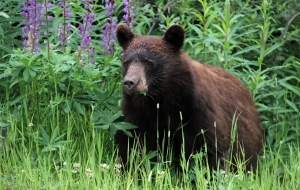 A chained dog in an open yard can’t run away if a bear attacks, and an unleashed dog is very likely to chase a bear. I had a terrifying experience with this once when my dog went after a bear in my yard! The dog took off chasing the bear and I ran after her as fast as I could to stop her. I caught her, but then I tripped. More than once! It probably looked hysterical and if I had it on film you’d die laughing, but it felt more like in a horror movie when the victim keeps falling over and can’t get up fast enough! Luckily the bear just watched all of this comedy and wandered off, but it could have been much worse. You never know how your dog will react with a bear, so be very careful. The most important thing to do if you actually see a bear in your yard is to call Animal Control. Bears that are no longer afraid of humans need to be captured and relocated further away from people before anyone gets hurt.